This begs a few more questions. Does this give you more or less pizza than a typical, round pizza? How much more crust are you being saddled with by purchasing this shape pizza? Do we need extra tubs of garlic butter fat? How do you slice this thing? 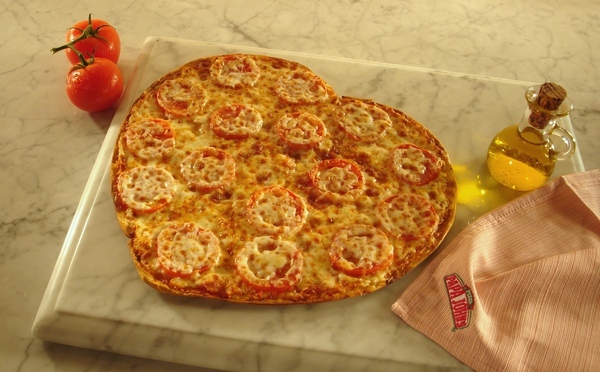 Can we determine the area of the pizzas knowing A) the cost of a regular, circular pizza and their areas and B) the pricing difference between a one-topping heart pizza + cinnaple (?) 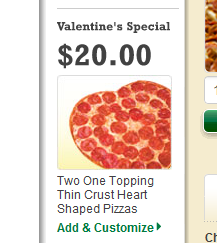 and two heart shaped one-topping pizzas? Or at least, can we determine the size they should be? How do you describe the size of a heart shape? Students research how to find the area of a heart-shape. Students decide whether or not this is a “good deal” for the price. Students come up with other ridiculous shapes for holiday themed-pizzas (i.e. football shape for Super Bowl Sunday, evergreen shape for Christmas), find the area, perimeter (crust) and develop a pricing scheme. Order a pizza and sample for yourself. Better than flowers. Side note: if anyone does decide to order this for dinner tonight. Please think of me and email me pertinent measurements and pictures so I can repost them.